With multiple cats, we sometimes forget how chaotic our lives are until we get back to the litter box. Between the smell and the mess, we do our best to figure out how to get maximum odor protection without extra litter on the floor. We took the time to research and review some of the top litter boxes on the market, so you don’t have to make litter box time any more chaotic than it already is. You’ll be able to choose the best litter box for multiple cats only after you know what you’re looking for. From odor control to self-cleaning features, you will want to dig a little deeper than what the litter box looks like. Here are a handful of characteristics we found helpful to keep track of when we found the best litter boxes. Odor Control: No one likes a smelly litter box and the type of litter you use isn’t the only way to control odor. Look for an odor control option to keep the smell sealed in and the fresh air free of smell. Odor control litter boxes will make life easier and keep your air fresh and clean. Size: Whether you have two cats or four cats, the size of the litter box gives your kitties more room to do their business. The size can also help you hide the litter box if you don’t have much room to separate the cat bathroom from the rest of the house. 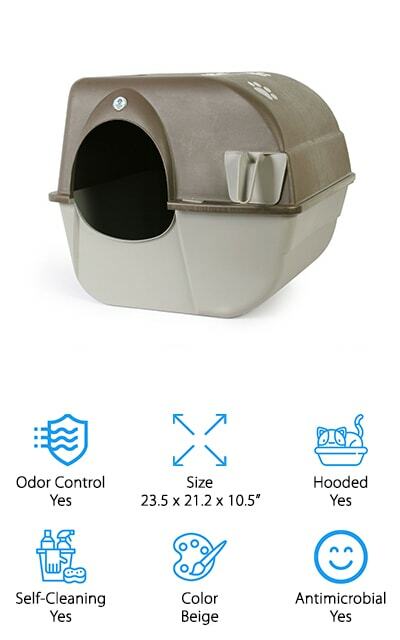 Hooded: Hooded litter boxes are great at keeping the smell and litter in. Most hooded litter boxes also have higher walls so if you choose to remove the hood, you can still use the litter box separately. Hooded litter boxes are great for cats who usually make a mess. Self-Cleaning: Self-cleaning litter boxes are all the rage. Instead of grabbing the scooper yourself, the litter box can clean itself making your life as easy as taking the trash out. If you’re tired of scooping the litter box, look for a self-cleaning feature! Color: The color of the litter box is another characteristic that can help you hide the litter box from the public. Most litter boxes come in muted colors, but if you want something bright be sure to take a look at the color before buying. Antimicrobial: Some litter boxes are antimicrobial, or in other words, they kill bacteria and keep it from growing inside the box itself. The last thing you want is for your kitties to get sick from using the litter box and an antimicrobial litter box can help prevent that. Now that you know what to look for, you can take a peek at all of our favorite choices for multi-cat litter boxes. Our top pick represents our favorite luxury pick, while our budget pick represents our favorite pick for those shopping on a budget. If you’re ready to get reading, here’s the scoop to help you find the best rated litter box for multiple cats. We chose Nature’s Miracle Corner LItter Box as our top pick because it gives you everything you need to keep the smell of two cats in one discreet area. 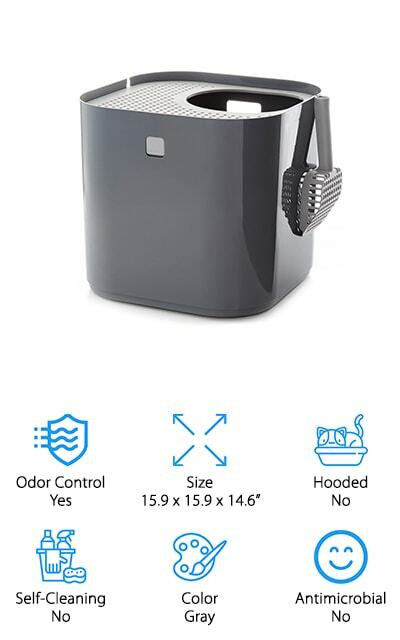 Although this litter box is not self-cleaning, you’ll be able to keep the odor and mess at bay with a charcoal filter and hooded top. The charcoal filter absorbs all unwanted smells for up to 3 months and once it’s done, you can buy a replacement filter. The litter box is also antimicrobial and keeps bacteria at bay to prevent your cats from getting sick. Cleaning is easy, as you can remove the lid without a hitch and scoop away. The non-stick surface of the box keeps litter from caking onto the sides and odor from making its way out into your living areas. Nature’s Miracle Corner Litter Box is a simple, yet handy way to keep your cats’ messes at bay while keeping them safe, happy, and healthy each time they go to the bathroom. The Petmate Giant Litter Pan is our budget pick because it has everything you want from a litter box and a few extras, too! Though this litter box doesn’t have a hood, the walls are meant to keep litter in without spilling over the sides. Even though this litter pan may seem simple, it can hold up to 30 pounds of litter. There are also two storage areas on the side to store your litter scooper and waste bags. If you need to pick up the litter box at any time, your hands will thank you as the comfort grip on the sides make it easy to carry to and from the trash can. Petmate has been one of the most trusted name brands in the pet industry for years and this litter box is no different. This litter box was made to last for years to come and to make your life much easier with less frequent cleanings. If that’s the name of your game, choose the Petmate Giant Litter Pan! The Purina Tidy Cats BREEZE Litter Box is truly a breeze to clean. With a hooded top, the mess will stay inside the box. Absorbent pads that are stored underneath the litter will trap the odor and moisture keeping your living areas smell-free. The litter box is not self-cleaning, so you will have to clean the box yourself from time to time. The litter recommended for this box are little dust-free pellets that are meant to absorb the smell and solid waste. The pellets also keep your litter box fresh for up to one month for one cat before needing to be replaced. 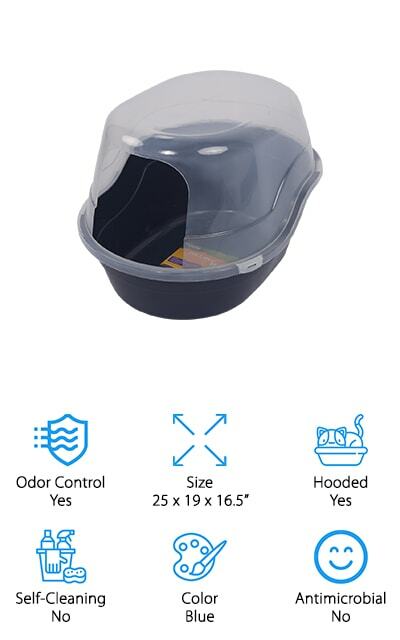 This three layer litter box that includes the hood, litter area, and absorbent pad drawer is meant for multiple cats as it does double duty on keeping smells out of your home and your fresh air fresh enough for guests to wonder if there’s a cat box around at all! 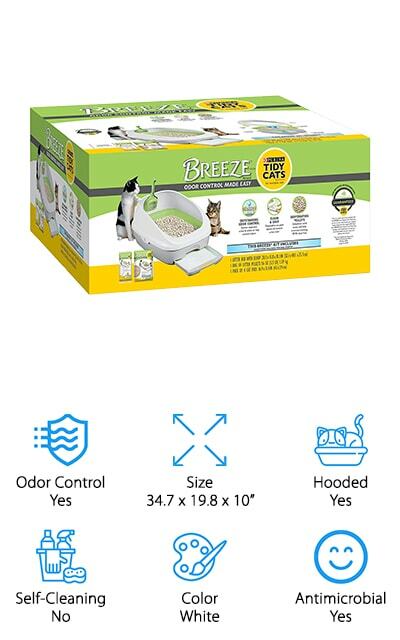 Grab yourself a Purina Tidy Cats BREEZE Litter Box to make litter box cleaning a breeze. The IRIS Open Top Litter Box is another high-walled litter box made for kitties who make a mess. This box doesn’t come with much else than itself, but it’s a good buy for those who want a simple solution to their messy cat problems. 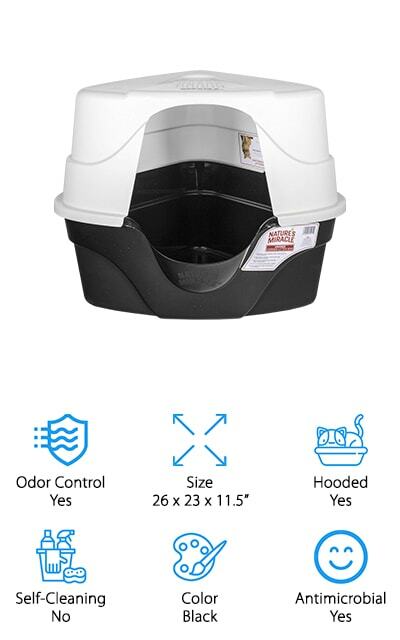 You can find this litter box in two different colors and also order a hood for your litter box separately if you decide you need one later. If you decide to get a lid, the lid comes with a handle to easily move it from one room to the other and a flap to keep the mess inside. The box is jumbo sized so it’s perfect for a multi-cat household. With your purchase of this litter box, you’ll also receive a litter scoop to make cleaning easier in an all in one set. For a simple solution to multiple messy cats, you’ll get the best bang for your buck with the IRIS Open Top Litter Box. The Petphabet Litter Box is our first brightly colored litter box. It comes in many colors, so many it’s like choosing a color out of a rainbow! 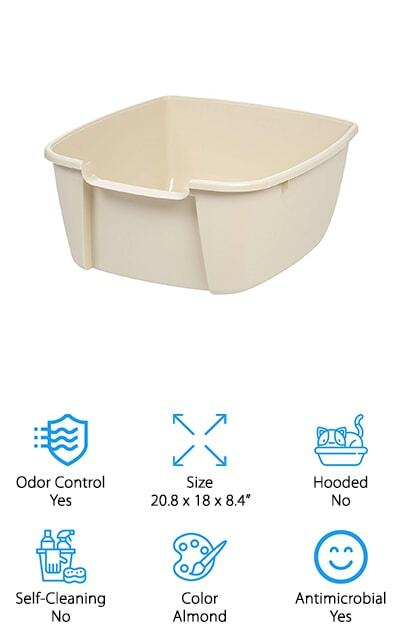 This extra large litter box is a great fit for any cat who doesn’t do well in small spaces or multiple cats who need extra space to go to the bathroom. With an antimicrobial surface and odor control, any waste left in the box will be easily removed without getting your pets sick. The hood is easily removed to give you access to clean and snaps back securely. For cats that are scared of gates, this box is just for them as the open door gives cats easy access. The deep litter pan gives you leak protection and odor control as it keeps the smell from exiting the litter box into your home. If your cats have a bit of a personality and you’re interested in showing it off, the Petphabet Litter Box gives you a handful of color choices with all the benefits of a tidy litter box. The CatGenie Cat Box is our first self-cleaning cat box on the list. Shaped like a traditional human toilet, this cat box also needs a water hookup like your toilet does, too. This cat box uses washable granules instead of traditional litter as it rinses the waste down and out through the cold water system. Just plug it in, turn it on, and wait until your cat goes to the bathroom. Shortly after your cat goes, you’ll be able to see the litter box wash the waste away, the granules clean again. These granules are good between 2-3 months depending on how many cats use it, so be mindful of that when it’s time to replace them. 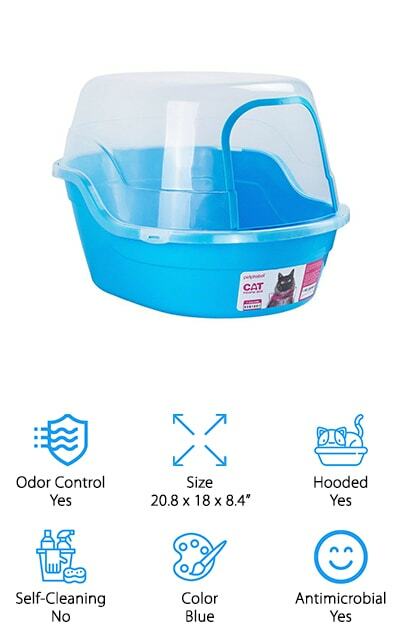 CatGenie suggests that no more than 3 cats use this litter box. If you’re into the idea of never having to clean a litter box again, the Cat Genie Cat Box is considered a top choice for you if you’re looking for the best self cleaning litter box for multiple cats! The Omega Paw Litter box is not an automatic self-cleaning litter box, but it’s self-cleaning with just a few simple shakes. With its patented grill mechanism, you may proclaim that this as the best kitty litter box for multiple cats! Roll the litter box over on its side and then pull out the tiny scoop styled drawer to separate the clumped and solid waste from the rest of the litter. It’s as easy as rolling it over to the right and dumping out the scoop! No electricity or replacement filters are needed. This litter box is also hooded to keep the litter and messes in. It’s also ideal for households with big cats and multiple cats, too. Each litter box comes with a 1 year warranty in case of any defect, too, so you really have nothing to lose if you decide to try out the Omega Paw Litter Box. Another one of our favorite litter boxes is the Favorite Cat Litter Box! 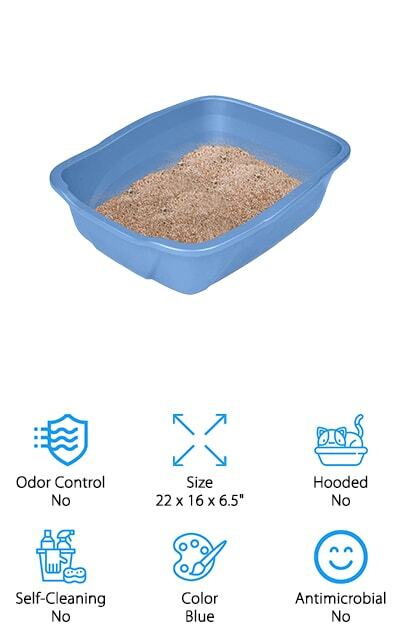 This 25 inch litter box is perfect for all cats, big or small. It’s as easy as snapping on the hood to keep the mess in and snapping it off to clean it. The hood and high walls control the odor and keep it tucked away inside the litter box. Despite it being a taller litter box, it’s made out of lightweight plastic making it easier to move the box from one room to the next. The hood doesn’t have a flap for skittish kittens who aren’t a fan of doors and gates giving them convenient access to their bathroom. Its non-stick surface is also a big bonus for you because cleaning is a breeze without waste sticking to the sides. The Favorite Cat Litter Box is a great option for you if you have multiple cats who love to make a mess but love their privacy. The Modkat Litter Box is perfect for the modern cat lady or cat man. No more bulky hood to remove every time you go to clean the litter box, just swivel the lid and clean away. The small hole at the top is where your cat can drop in to do his business. The lid serves as both a walk off mat for excess litter and the lid to keep the litter inside from getting out. Cat owners from all around love how this litter box has taken the litter tracking down to almost nothing. Each litter box comes with a tarp liner to keep the inside of the litter box clean. You’ll also get a litter scooper with your purchase that can be stored outside your litter box for easy access. The Modkat Litter Box is the perfect way to give your cat a discreet way to use the bathroom without creating an eyesore in your home! Our last cat litter box on the list is the Noa Store Cat Litter Box! This litter box is your classic litter pan. Made from durable plastic, it also has a high polish finish for odor and stain resistance. This litter box only comes in one color, but if you’re not picky on color this box has everything you need. This litter box is known as the best litter box for multiple cats who have basic litter pan needs. Some have even used this litter box for cats who have recently had kittens and said that it worked marvelously. 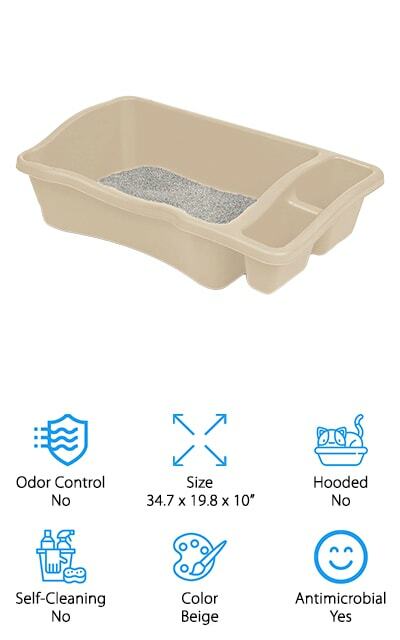 Although this particular model doesn’t have odor control or antimicrobial properties, the durable plastic and price make this litter box a great value. 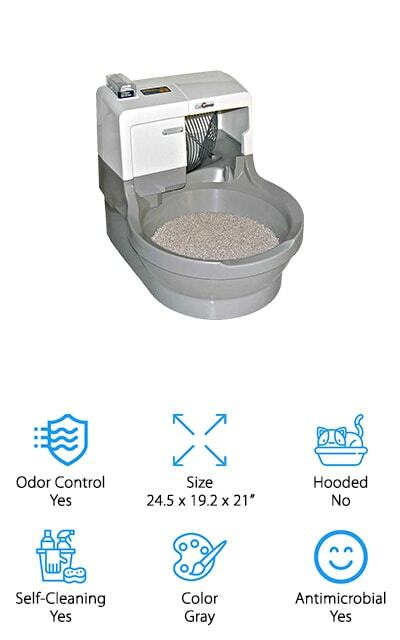 The bottom line is: if you’re looking for a simple, sturdy solution for your home with multiple cats, the Noa Store Cat Litter Box has the essentials you need to keep your home clean and waste-free.